Q: Hi Abhineet , thanks for your time to talk to us. 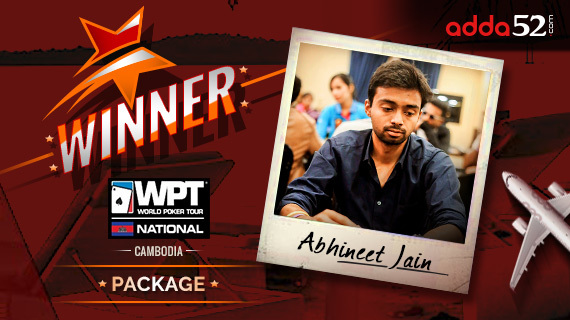 First of all, congratulations on winning the WPTN- Cambodia package satellite. How are you felling now? A: I am pretty happy with my performance as the field was tough with some of the best tournament players of the country fighting it out for the first position. During the game, I followed the tight aggressive strategy throughout, and did get lucky in a multi-way preflop all in but that’s part of the game. Q: How has been 2016 at the online poker felt? A: This year has been sort of a breakthrough year in terms of online poker. I shipped almost every satellite I played and done very well in online cash games on almost all sites. Q: traveledTell us about your game-play experience on Adda52.com. For how long have you been playing on our site? A: It has been almost 3 years that I have been playing on Adda52 and the experience has been great. The site hosts the biggest online cash games in the country and provides a platform for all kinds of players to showcase their skills, be it tournaments or cash. A: Not at all. Earlier,travelled to Las Vegas, China and United Kingdom – courtesy Adda52. I don’t play live poker at all. Its only when I travel for tournaments that I play few cash games along with some side events.